Explorations in Quilting and Life: A Fun Project! Last week I was easing my way back into life after India. 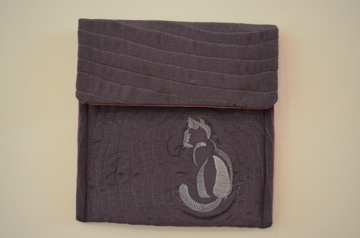 As I started up my Bernina once again, I wanted a simple, yet practical project that would even allow me to play with that embroidery side of my machine. My newly organized stash and quilt-related supplies actually mean that I can find things that I purchased along the way - imagine that! I found a pattern by Jamie Kalvestran for "Fat-Quarter Scrap-bags" that I must have purchased a while back. It was what I needed to create this cute little bag. The pattern was extremely simple and the directions were very clearly written. You can actually create the bag using only one fat-quarter. I just went online to find a source and found a great website by Jamie. The pattern I used didn't seem to be available but a very similar one is found here. I also learned that Jamie has some interesting blogs on fabric design listed on the website that I expect I will follow. As a bona fide Cat Person, I love this, Judy! Might just have to track it down! And yes, it was the perfect thing to get your creative mojo out of jet lag and back in action.